Wix.com is a cloud-based website builder that makes it easy to create beautiful, professional website. With the Wix Editor, users are able to arrange and customize any element on their site. Traditionally Wix.com has targeted people who want to create their web presence without coding. 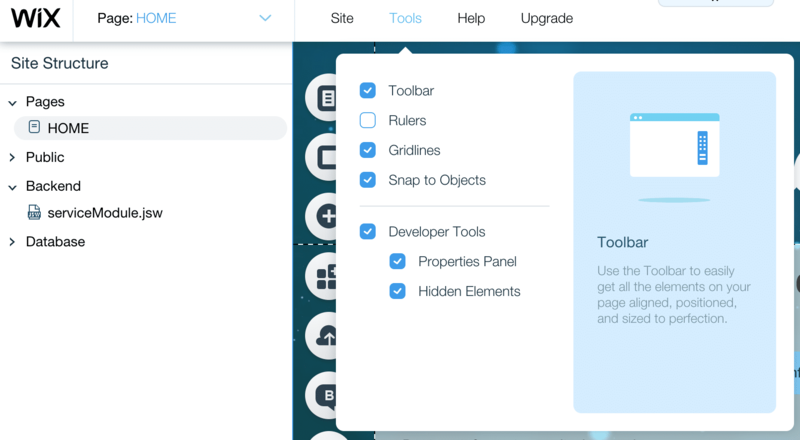 Now Wix has added a big new feature to their platform: Wix Code. 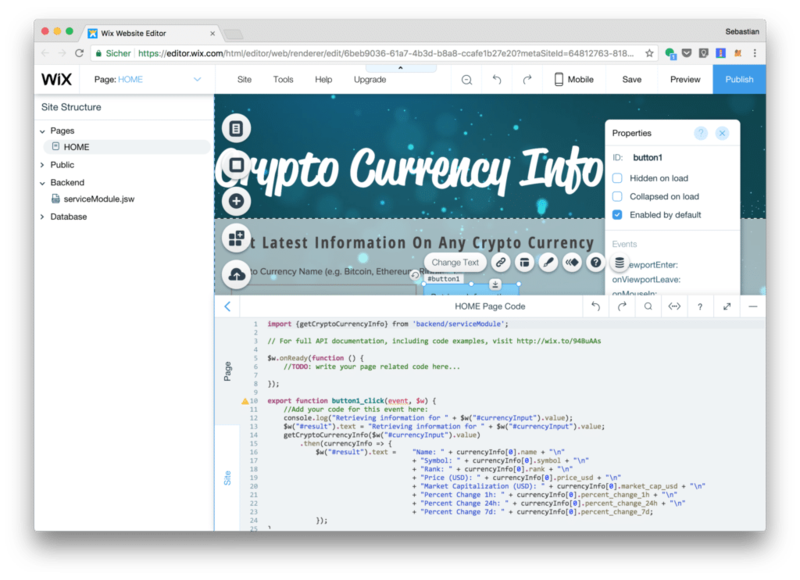 In this tutorial we’ll take a first look at Wix Code and go through a practical real-world sample application. You can just follow along by creating your free Wix.com account and follow the step-by-step instructions included. 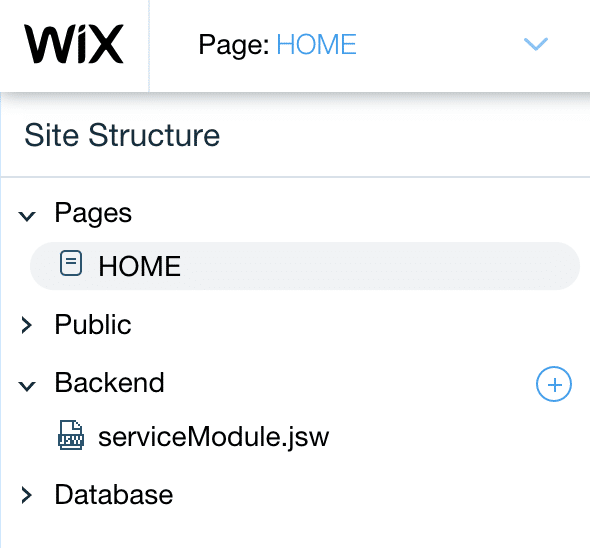 Visit the Wix Code Resources page to learn more about its features, read articles, watch and video tutorials, view sample code, check out API references and more. With the database functionality you can set up collections and use them to store visitor details, product info and more. You choose how and where to use this data on your site, and control who can add, edit and view it. 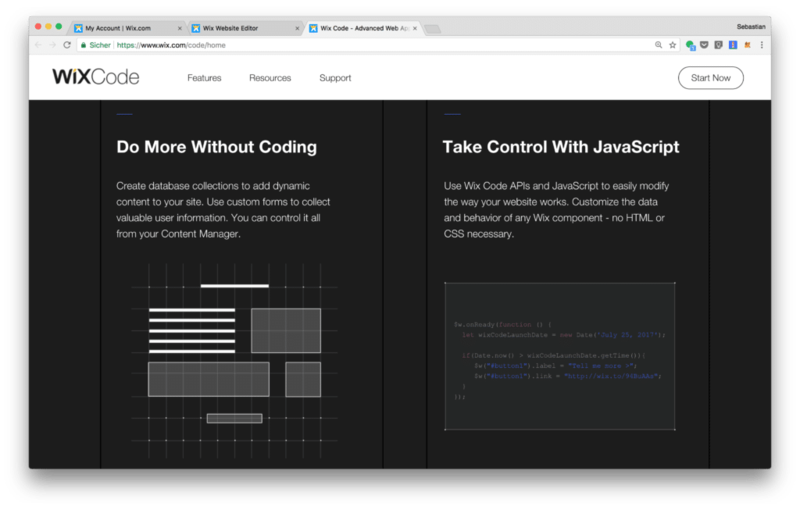 Create a single list or grid layout that automatically updates site pages with unlimited content from your database. Feature all your news stories, business listings and more. With dynamic pages you can use a single design style and create 100s of new pages, each with a custom URL and unique content. Organize by category and update content easily from your database. 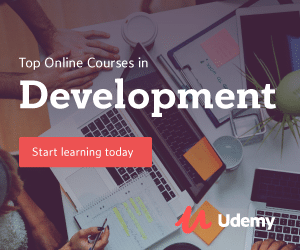 Create application forms, review sections, quizzes and more without writing a single line of code. All the data you collect will be automatically stored in your database and can be used anywhere on your site. Access 3rd party APIs to further enhance you website with dynamic data. First, let’s design the user interface using the Wix Editor. We’ll drag and drop all the page elements we need and customize their look and feel. Of course you’re free to design the user interface by yourself. 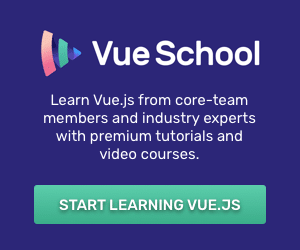 You should make sure that at least the following controls are available on your site, so that the code we’re going to implement in the next steps is working. To retrieve crypto currency data we’re going to use the free REST API which is provided by Coinmarketcap.com. An overview of the API can be found at https://coinmarketcap.com/api/. For our use case the relevant API endpoint is https://api.coinmarketcap.com/v1/ticker/[CurrencyName]. 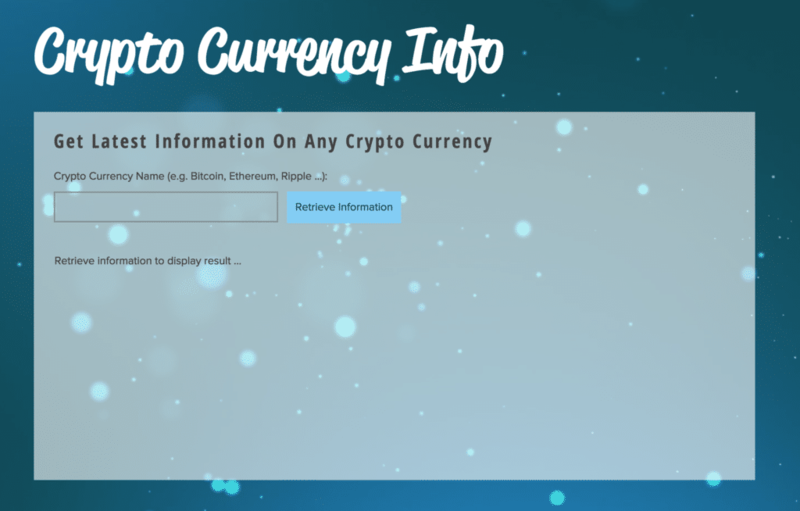 In order to access this API endpoint and retrieve information about a specific crypto currency we’re implementing a backend module for our website. The second parameter is a configuration object in JSON format. In our specific case this object is containing the property method which is set to string ‘get’ to define that we’re initiating a HTTP GET request. 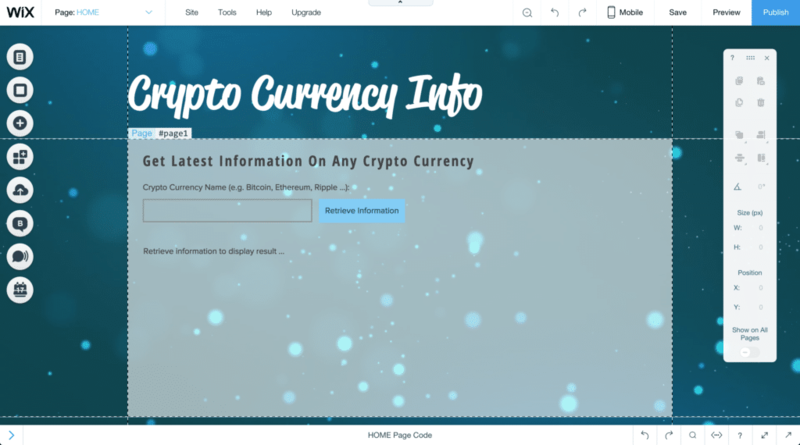 The build up the URL string which is passed into the fetch method call the service method getCryptoCurrencyInfo is expecting to get the name of the crypto currency as an input parameter. 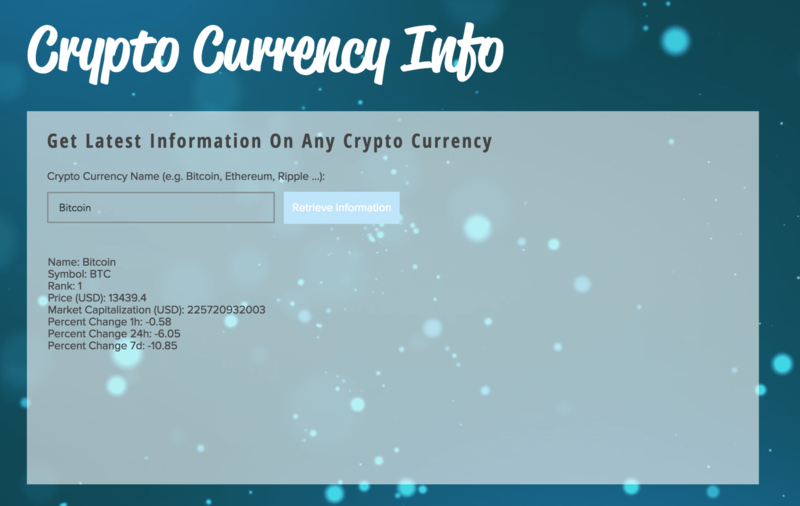 The complete URL is built by concatenating the base URL endpoint ‘https://api.coinmarketcap.com/v1/ticker/’ with the currency name. In the next step we’re ready to create a click event handler method for the button’s click event. $w("#result").text =     "Name: " + currencyInfo.name + "\n"
+ "Symbol: " + currencyInfo.symbol + "\n"
+ "Rank: " + currencyInfo.rank + "\n"
+ "Price (USD): " + currencyInfo.price_usd + "\n"
+ "Market Capitalization (USD): " + currencyInfo.market_cap_usd + "\n"
+ "Percent Change 1h: " + currencyInfo.percent_change_1h + "\n"
+ "Percent Change 24h: " + currencyInfo.percent_change_24h + "\n"
Here we’re calling the backend method getCryptoCurrencyInfo and passing in the name of the of the crypto currency the user has provided in the input field currencyInput. To read out the current value of that input field the following code is used: $w("#currencyInput").value. If you have been using jQuery before this syntax should look very similar to you. The getCryptoCurrencyInfo method is returning a Promise so that we’re able to connect the call of the then method to wait for the response from the external API. Once the result is available and the function which is passed into then is executed we’re making sure that the output is done by setting the text property of the result control. 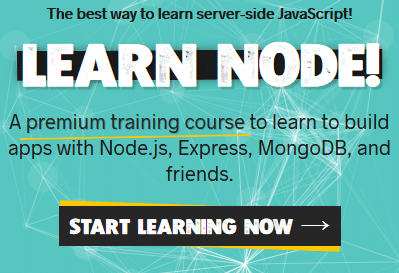 You can try Wix Code today. This post is sponsored by Wix.com. Thanks a lot for supporting CodingTheSmartWay.com!